The Board of the Griffin Neighborhood Association joined this last month with the Board of the Capitol Land Trust to extend the term of the Steamboat Conservation Partnership for another five years. The Steamboat Conservation Partnership is a unique agreement between a neighborhood association and a land trust. We are happy to report the SCP has generated more than $80,000 during the first five years of the Partnership. This sum exceeds their five-year, $75,000 goal. All contributions are tax exempt, because they are made directly to Capitol Land Trust, which is a 501(c)(3) organization. Funds collected by the SCP are used by Capitol Land Trust to pay for staff time related to properties in the Steamboat Peninsula Region. This work in the Steamboat Peninsula Region includes developing agreements with owners of significant natural areas and working lands to conserve their property, maintaining relationships with property owners who already have given or sold their property or development rights to Capitol Land Trust, periodically meeting with a committee from our area on potential areas to conserve, and leading tours of protected areas. 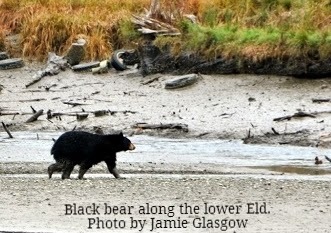 The Adams Cove Preserve, 35 acres and a pocket estuary on Totten Inlet. In addition, an agreement will soon be signed conserving an additional 175 acres as part of the Wynne Conservation Easement, located in the Schneider Creek Valley with the headwaters of the creek. This will add to the existing 355 acres that are part of the Wynne Conservation Easement. How does the Steamboat Conservation Partnership work? Capitol Land Trust places contributions to the SCP into a segregated trust account and uses the funds to finance a portion of its efforts to develop relationships with property owners in the Steamboat Peninsula Region, write habitat acquisition grants, negotiate agreements with property owners, and manage properties or easements within the Steamboat Peninsula Region. Defined as the watersheds of both Eld Inlet and Totten Inlet, the Steamboat Peninsula Region includes the Steamboat Island/ Griffin Peninsula, western Cooper Point draining into Eld Inlet, the eastern part of Mason County draining into Totten Inlet, and areas draining into Kennedy Creek or McLane Creek. A priority focus is made on lands located within the boundaries of the Griffin School District. The Land Trust has a proven record of success, and has permanently conserved more than 5,000 acres in four southwest Washington counties, including more than 14 miles of south Puget Sound shoreline. 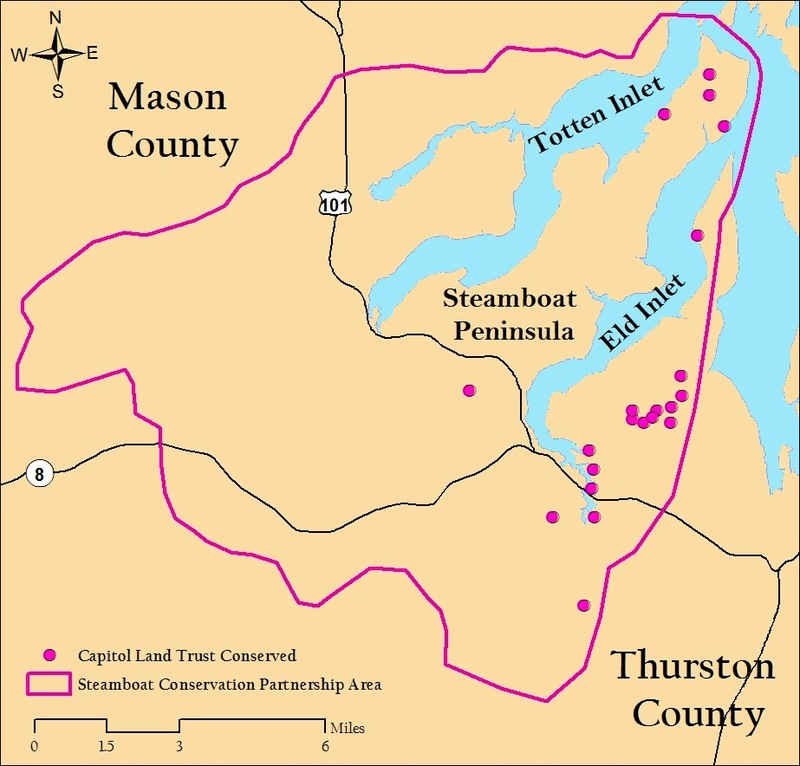 The map below shows the natural areas and working lands conserved by Capitol Land Trust within the Steamboat Conservation Region. Discussions are underway with other property owners to conserve additional lands within our Region. Click here for a complete description of all conserved lands. If you would like to learn more about how you can support the Steamboat Conservation Partnership, click here to read their web page. The Board of the Griffin Neighborhood Association is proud of its partnership with the Capitol Land Trust and we hope you will join us in actively supporting the efforts of the SCP.